Sales have launched at the Naftali Group’s Two Ten West 77th Street, the new construction offering on the Upper West Side. The 18-story condo has 25 luxury residences designed by Thomas Juul-Hansen and inspired by natural materials and Danish modernism. The new building is near Central Park, the American Museum of Natural History and Riverside Park. Clad in hand-formed Danish brick, the facade has Juliet balconies with oversized mahogany windows. 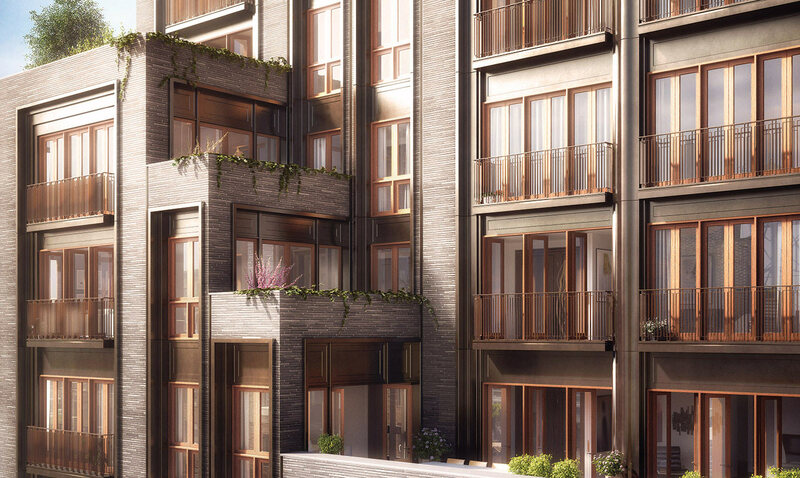 “Two Ten West 77 presented a unique opportunity to innovate architecturally while respecting of the character and beauty of the Upper West Side historic district,” said Miki Naftali, founder, chairman, CEO of the Naftali Group. The 77th Street residences include half and full floor homes with open layouts. Some have fireplaces and private outdoor terraces. They range in size from 2,058 s/f three-bedrooms to a 5,973 s/f duplex penthouse with outdoor space. Every residence will be privately accessed by an elevator that opens directly into the residence. Corcoran Sunshine Marketing Group is the exclusive selling agent for Two Ten West 77, which has a 24-hour doorman/concierge, a roof terrace, fitness center, bicycle storage. Prices range from $4,850,000 to over $21,000,000. Occupancy is slated for the first quarter of 2016.